Discover how Human Resources Help Desk analytics can transform your organization. On June 3rd LBi Software will host a webinar demonstrating the power of HR Help Desk Analytics and Big Data. The benefits of implementing an HR Help Desk and Employee Self Service Knowledge Base solution are many, including fewer calls into HR, consistent adherence to corporate business policies, greater employee satisfaction, and more. However, a robust, well-designed and mature solution can provide even greater value through powerful analytics. By delivering HR Help Desk Key Performance Indicators (KPI) in a graphical Executive Dashboard format, senior management will have the right information at their fingertips, in real time and with pain points clearly and visually presented, to make the critical decisions necessary to maximize organizational performance for your business. 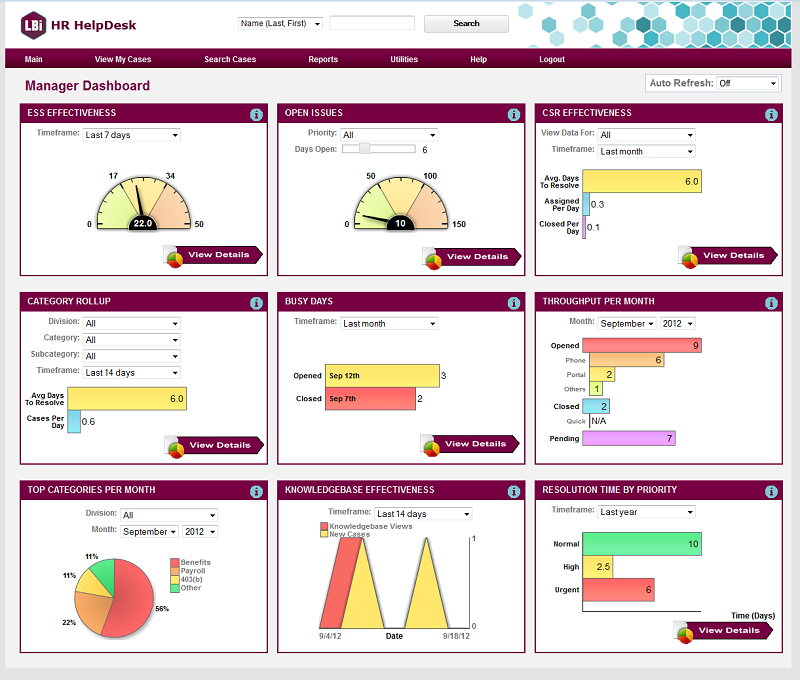 We will also show how this valuable data can enhance other KPI tools such as Balanced Scorecard analytics. Find out why Big Data analytics is truly a necessity to succeed in today’s highly competitive business climate! This webinar will take place on Tuesday, June 3rd at 2:00 PM ET. During this session we will discuss and demonstrate how LBi HR Help Desk analytics can transform your organization by providing a keen understanding of your workforce dynamics, including exposure to general employee attitudes, management issues, festering labor disputes, and other workplace concerns that can impact productivity. Sign up now.